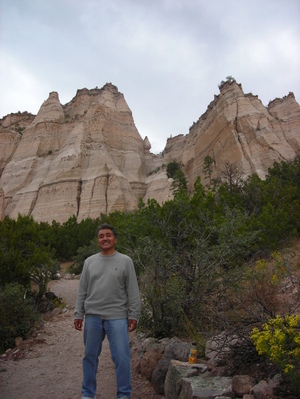 Looking at Montezuma Castle, I was reminded of Howard Zinn's book A People's History of American Empire where Zinn threads truth throughout historical events, thereby toppling pre-fabricated stories--from our long tradition of spin--better known in schools today as History 101. Montezuma Castle was home to the Southern Sinagua (meaning without water) natives, just outside of Sedona. 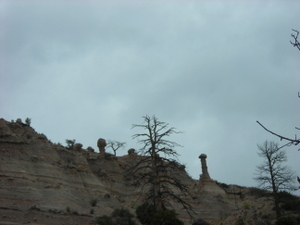 It's a popular stop in the Verde Valley along the way from Phoenix to Sedona and Flagstaff, Arizona. 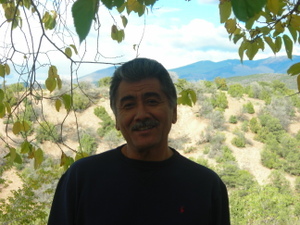 As are its sister sites, Montezuma Well and Tuzigoot. Montezuma was the Aztec king in what is now Mexico and Central America. When the Europeans "discovered" America, they thought the remnants of these cliff dwellers was the work of Aztecs, hence the name Montezuma. 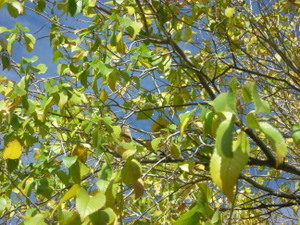 It's great to know that a clean air, unusually beautiful area is close to where I currently live in Southern California. I flew to Phoenix and rented a car but flying these days is unpleasant, so should I return to Sedona, I'll drive stopping in Palm Springs for a night. Other than coyotes and cowboys, Sedona is a quiet town that will likely remain so because there's a cap on population growth at 22,000. Right now, Sedona population is at 19,000. This ensures air quality should remain relatively clean. Tours of the Universe, which I wrote about here. Red Rock Jeep Tours with our cowboy guide Dan, which I allude to here. Sedona Trolley, which makes going carless in Sedona easy. It's a hop on and hop off trolley that takes you to several town highlights, including on the first Friday of each month when the trolley takes you to art galleries. 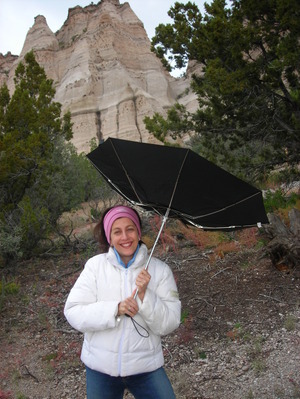 A very Sedona thing to do, as this area is known for its artists and spiritual retreats. Out of Africa Wildlife Park is not only a great place to see lions, tigers, jaguars, rhinos, giraffes, and lemurs up close and personal, it's the vision of Dean and Prayeri Harrison who in 1988 decided to share their love of wildlife at this park where you can take a Serengeti Safari. The safari gives you a feel for Africa in Arizona. Giraffe, zebras, ostrich and more are frequently touchable. While many of the animals are robust, others are rescue animals that have been injured and find good care here. Red Rock State Park is the location of one of the most photographed areas in Sedona. 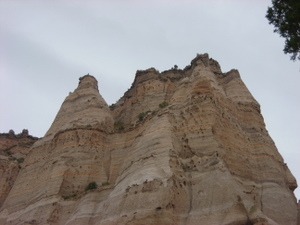 Cathedral Rock is here (photo above) and not only breath-taking, it's one of four major energy vortexs in the area. I took several photos and video. Sedona's clear, dark nights are ideal for star-gazing and I could think of nothing better to do on New Year's Eve. So last Wednesday I took a 15 minute drive from West Sedona to experience an unforgettable Tour of the Universe with Evening Sky Tours. Along with a group of locals and tourists, I sat in fold 'em up chairs, warmed by blankets, and kept my head up, eyes peeled on the night sky open to see whatever I may. Meanwhile, astronomers Dave and Matt had mighty telescopes to view stars in the sky and we took turns. In addition to viewing the vast universe, they gave us the scoop on galaxies, comets, shooting stars, satellites, nebula and groups of young and old stars alike. Turns out young and old aren't alike at all. The Pleiades are the youngest stars in the Milky Way galaxy (that's our neighborhood) and as such--like Hollywood stars-- they're hot! And give off a blue hue. According to Dave, the Pleiades are about 150 million years young, so young they weren't even around when the dinosaurs roamed earth. Of course, Pleiades have nothing on the M15s--a group of stars just shy of Venus and 12 billion years old. Which is good news for us aging stars. Apparently, we get hotter with age. When I looked through the telescope at the Pleiades, I saw twinkling flecks of star light. The stars appeared like thousands of diamonds against the night sky, and reminded me of sand sparkling in the sun after a tide washes over, cleaning the way. Just another new year, protecting delicate flowers, who hang by red rocks in the dead of Sedona's winter. All in a day's venture before posing on the edge of a cliff at Oak Creek Canyon enroute to Flagstaff, Arizona. 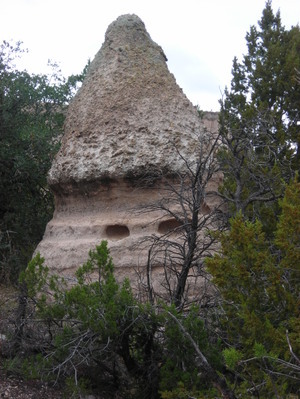 Off the 25 North, driving from Albuquerque to Santa Fe are Indian pueblos and their land. 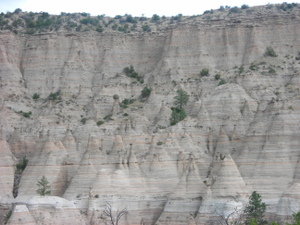 We took the turnoff for The Pueblo de Cochiti, and discovered the Kasha-Katuwe Tent Rocks National Monument, elevation 5,570 to 6,760. We walked the loop, as rain started. 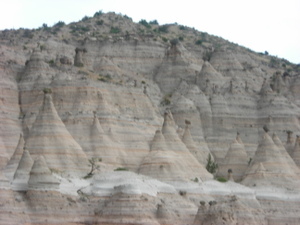 Beautiful tent formations as result of volcanic eruptions 6-7 million years ago. Signs of human occupations span 4,000 years. The Indians inhabiting nearby pueblo are ancestors from settlers in the 14th and 15th centuries. 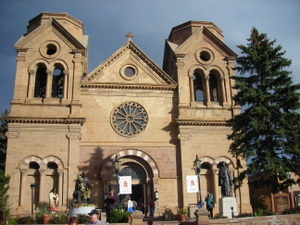 A draw for artists to Santa Fe, New Mexico. 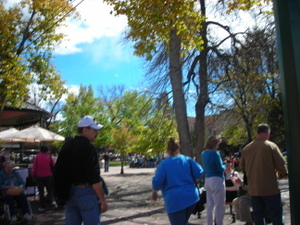 And clean air seekers, Santa Fe is considered quite clean but be forewarned that the air is quite thin at 7000 feet, and some people, such as myself I'd learn, get altitude sickness. People with asthma and lung disease in particular are known to be prone to altitude sickness. I'm particularly happy with this photo of St. Francis Cathedral just off old town square. 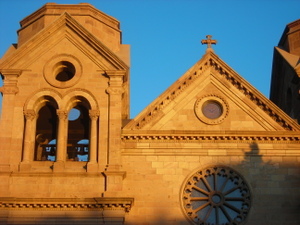 I took this at sunset after attending my first mass. Ever. A young Hispanic woman sang like a seasoned pro. The priest wore green. A festive service, reflective of the ornate church inside. 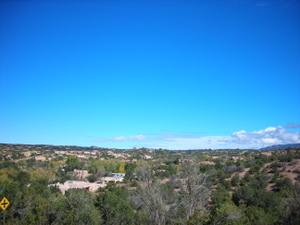 Here's a view of Santa Fe from the window where we stayed off of Artist Road. I saw this view a lot, as I recovered from altitude sickness. I'd never experienced this sort of thin air before, and it didn't agree with my system. It made me very tired and gave me a head-ache. I learned we're supposed to drink a lot of water and avoid coffee and alcohol. 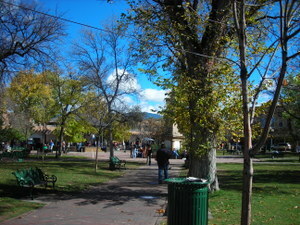 Here's the town square in Santa Fe. You can buy Mexican food everywhere at anytime. 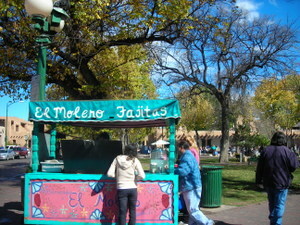 Santa Fe felt like a Mexican village with a PR face-lift to justify high prices. Turn over more than half the items we saw displayed in Santa Fe stores, and you saw: Made in China. Made in Mexico. Made in USA. All transported no doubt by polluting trucks. 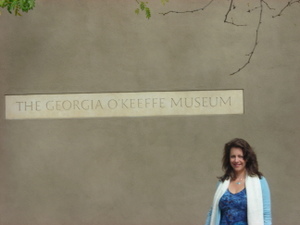 Here I am, looking puffy, feeling like I could pass out, in front of Georgia O'Keefe museum. I'm trying to enjoy our outting despite altitude sickness. I enjoyed museum, I've always liked the abstract yet realistic nature pictures of the Southwest O'Keefe is known for. I bought a framed white flower we'd seen called Donnabella. Georgia O'Keefe felt called to the Southwest, much like I don't. I'm sure it's wonderful for people that breathe well in high-altitude and don't mind dry air. I learned neither really agree with my system. Anyway, Ms. O'Keefe enjoyed creating abstract paintings because she could choose what to emphasis, what had meaning for her in a visual display. She particularly loved a mountain outside her Southwest home northeast of Santa Fe, in the desert where the landscape is bare, the air is dry, one's skin cracks easily, and I miss the big trees of Washington State. Oops, it's sideways. 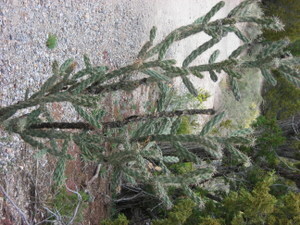 You see an example of Southwest vegetation. Dry brush, is how Fernando expressed it, his head aching, balance off, as altitude didn't agree with him either. 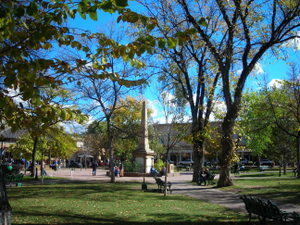 Here's trees in Santa Fe town square. 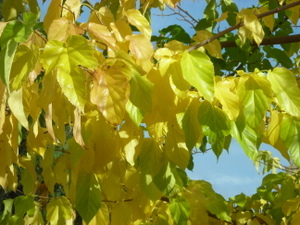 There was fall color, too, some leaves I particularly loved. Blue Corn Cafe on San Francisco Street has terrific Mexican food, and according to our adorable smiley-faced waitress, Stephanie, people have driven hundreds of miles for their corn soup. It was really good. Stephanie is saving money for massage school, an overpriced $8000, so I hope you tip her well. Inn of Anasazi is an old, authentic Indian-styled Inn with an award-winning restaurant. The lime lemon salmon was one of the best I've ever had. We also shared a vegetarian sampler dish. Delicious.